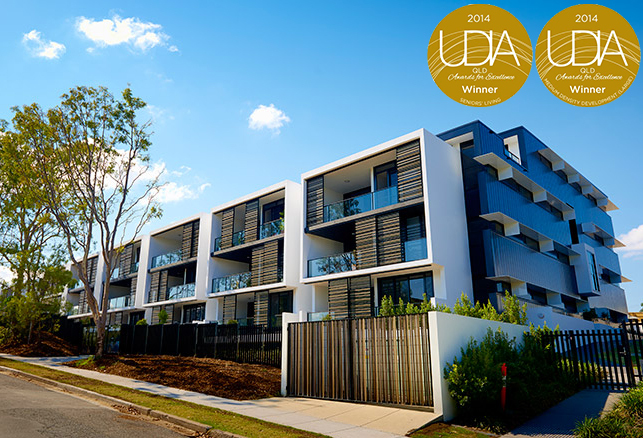 The 2014 UDIA State Excellence Awards celebrate Queensland’s contemporary knowledge, skills and innovation in the urban development industry. The awards recognise the best of the best; the people and projects that go beyond the built environment, to create wonderful communities. Jensen Bowers is proud to have provided a number of town planning and surveying services for the following notable developments. The Village Coorparoo developed by The Village Retirement Group was awarded the best ‘Seniors’ Living’ as well as ‘Medium Density Development (Large)’ for 2014. The Village Coorparoo is located on Cavendish Road and was opened in February 2012. Central Village developed by Metro Property Development was named a finalist in the ‘Urban Renewal’ category, and Eastwood Apartments developed by Pellicano Pty Ltd also earning finalist status for ‘High Density Development’. Winner of the ‘Wildcard Award’ was Creating Gateways – The Toondah Harbour and Weinam Creek Priority Development Areas developed by the Redland City Council and Economic Development Queensland. Jensen Bowers enjoyed working with our clients and various co-consultants on all of these projects. We congratulate the above developers on their great results!